Humiliated and standing stupid and dumb, I lost the property wars. But NOT because I built my fence unlawfully upon my neighbor’s property but because I FILLED THE FORM OUT INCORRECTLY! My “crime” was not hiring a lawyer and a bookkeeping error. Come in and read all about it cause I can help keep it from happening to you. catch up here if need be. First, I stand before you, figuratively, a beaten and bloodied woman. But I am not without fault, let me hasten to insert. Said fault being but the naiveté of a silly widow woman who thought life was fair. I want to make an argument as to how better this thing could be handled but before this, I would like to advise yon ladies and gems on how NOT to handle a property dispute. On this, I am an expert. Let us clear up a few things first. If one clicks on my link provided above, and bothers to read my endless narrative (I know yon reader….I am tired of it too….next week I’ll will make up for it), one will see that I lambasted one Jamie King and yes, one Mr. Inteli….I don’t know his first name. As for Jamie King Esquire, of Tunnell and Raysor law firm, erase anything bad I said about him. Oh no doubt, yon readers, this fellow is one hard-boiled attorney but as far as has been ascertained, he did naught but the job he was hired to do and he did it well. Further, much as it pains me to say this, I did chance to speak to Mr. King and met him the day of the court trial when I did not receive any justice. He was nothing but professional, friendly and helpful. I would add that on the very day of the court hearing (11/6/15) I DID give Mr. King a copy of my survey so right there you think justice would be attempted but nonononono…..I was supposed to turn it over before this date so I was sent off by the Judge to answer the complaint. Now I don’t know where such a pamphlet exists but it was probably the Inteli’s modus operandi and, again, it worked with dumbbell me. Mr. Inteli might be a perfectly nice man but he stuck to his script and again, I was the sucker du jour. For I always thought that when you bought a house you always made sure you had a legal survey, proper title searches done, paid taxes and purchased insurance….man I been buying houses for years, I know how it works. And when the builder of Beaver Dam estates behind me got the county Zoning commissioner to send me a letter demanding that I tear down my fence, well I was distraught but comfortable that I did the right thing, I purchased a legal survey BEFORE buying the house. I went to the Sussex county council and on THIS post, and for the last time, I post the Cape Gazette article written about this story. Yes I knew that any one of those people in Beaver Dam (and there were a slew of them, folks, everybody beating up every damn body while I sat smug with my worthless survey) could take me to civil court and honestly, I was ready. I really didn’t want to “win” this fence case. I did want it settled. I thought that all I had to do was sit tight and when the court case came up I would show up with my survey and hear what the Judge wanted me to do. And no, I wasn’t positively convinced that MY survey was right, damn you can take what I know about surveys and put it up the behind of a flea and it will STILL rattle around like a BB in a box car. But I was willing to pay half for a new one, darn I might have sat down with the Intelis and worked out a deal except he kept acting like I did something wrong and all I did was be a good citizen. I don’t think adopting the offensive tact was such a good idea for goodness this all would have been settled eons ago had it been handled decently. Beginning with the county I add here, but we know that story don’t we? I did get a phone call earlier in the year offering a “settlement” if I only pay $300 franchise fee. When I said I considered settlement, THIS was not what I had in mind. For a grand total of nothing I probably would have given the Intelis what they wanted so long as it wasn’t adverse to me. I have no heirs involved with this property, I am not all that obsessive-compulsive about where the fence is and I need a new one anyway. So I turned down that insulting offer of paying Mr. Inteli for MY fence which was here over twelve years before his house was even an idea…..come on ladies and gems, was this the greatest move? YOUR CASE IS SCHEDULED FOR NOVEMBER 6, 2015 AT 11:00 AM. I wasn’t upset. I figured I’d take my survey with me, the Judge would look at it, and I would be instructed what to do. YOU ARE EXPECTED TO ANSWER THIS AFFIDAVIT BY 11/11/15. YOU WILL RESPOND TO ALL OF THE ALLEGATIONS IN THE PLAINTIF’S COMPLAINT. YOU WILL PROVIDE A COPY OF YOUR RESPONSE TO BOTH THE PLAINTIF’S ATTORNEY AND WITH THIS COURT. IF YOU COMPLETE THE FORM INCORRECTLY YOU RISK LOSING THE CASE BEFORE THE HEARING. WE STRONGLY SUGGEST HIRING A LAWYER BUT IF YOU CAN’T AFFORD ONE, CONTACT LEGAL AID AT 555-5555. Look at that….I just wrote the above and took me maybe three minutes. Instead I get some blurred copy from the Plaintif’s attorney, no phone number, and no instructions to file same with court. I’ve spoke to many of yon readers far and wide over the now three years plus that this case rages on. I spoke to some attorneys, I spoke to my council people, I spoke to some state legislators of all sizes and districts. Almost everybody, if not everybody, advised me to get a lawyer but I honestly thought that I could just show up with my survey and then follow the edicts. Now I am humiliated, laughed at, mocked….silly, silly woman, that a mere mortal should do that which only an attorney could do. And folks, had this case not involved some four feet of land with me NOT in possession of a legal survey, I surely would have hired an attorney. I have been told by many of those with whom I conversed that I filled out the forms improperly, that the court is a busy place and if everybody did things this way and that way it would be a mess for the court. I thought the court was for meting out justice…..again, silly me. For though I was found guilty and must tear down my fence and pay Mr. Inteli legal fees, I am NOT guilty of building my fence unlawfully on my neighbor’s land. Hell I didn’t build the fence at all although Mr. Inteli’s document said I built that fence on the very day of my husband’s funeral, imagine that, going to a funeral and building a fence after….amazing. I AM guilty of not following the precious procedures of the court and the court has all the power. If only I had one list like I made above….heck I’m a writer and can certainly investigate procedures online. This system is set up to make any idiot like me who thinks they can do the work of a lawyer get beat all to hell and THAT system worked. Meanwhile the Superior Court was not bothered with silly stuff like fairness and justice but hey, their books are in order. Not to worry yon readers, I am appealing and I will pay. I will not come out of this unscarred. But I have learned my lesson and am going to approach my legislators for a remedy for this situation, much like I approached the county council. BUT NO…..I am told. It is not the job of the legislators to control the court’s rules! But just who does a citizen seek should it suddenly seem that the court is not very fair in how things are handled, I ask? Not the job of the legislators , I am re-told. But whose, I ask? No answer. Evidently the court is all powerful with no controls over it. I am not going to broach this subject again this year unless the sky falls. Again I thank so many of you for offers of help and indeed, some of you attended the court hearing where I gave my simple survey to Mr. King ON THAT VERY DAY! And here I sit, guilty of a bookkeeping error and failing to hire a lawyer. NEXT : I promise next week a bunch of posts, got pictures and tidbits, the Sunday talk show and maybe a national scene must. Be patient with me yon ladies and gems, God is not done with me. 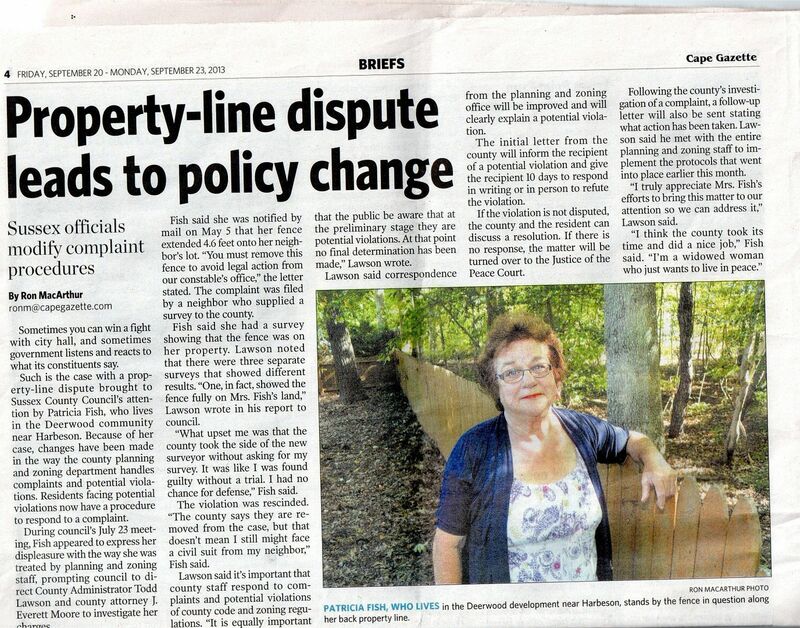 7 Comments on "The Beaver Dam Property Wars…..Final Update"
I’m glad to see a photo of the fence in question. I can’t see what effect it would have on your neighbor’s property, even if it is two feet over the line. I believe that you have a certified weenie for a neighbor. Yeah, that whole family are a bunch of certified weenies!! I’ve read through this saga, and I can’t believe you are an adult. You are 5 times my age and I can see you are clearly and surely playing the victim in this no-brainer case. How about taking responsibility for your own actions instead of blaming it on everyone else. You have stated numerous times that you want to live “peacefully”, while you are just giving your neighbors, the judge, the poor people who read the local newspaper and this god-awful blog a big pain in “yon” derriere. I find it ridiculous, yet hilarious, that someone your age is acting like a toddler over 4 feet of property. Googling “answer the complaint court” leads you to a host of general resources explaining the process. 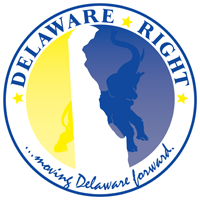 Adding the word “Delaware” gets you to the specific court rules. If only you had done that. It ain’t rocket science. Do you think it is “fair” for you to have published awful things about everyone else involved in this thing? Do I see blog posts ANYWHERE from your neighbors going on about “people from Maryland” and all of the other disgusting insults you’ve flung at every step of this thing? If you own a piece of property and your survey shows someone’s else’s stuff on your land, then you can get into a world of complications with your mortgage company, a potential future buyer, probate court, and a boatload of others down the road. That’s the problem the Inteli’s had, but you couldn’t give that flea’s behind about ANYONE else’s perspective than your own. You still keep going on about “crime” as if you were ever accused of one – you weren’t. Yes, when a complaint is filed in a court, you have a fixed time to file your answer to the complaint with the court, and then show up at the hearing. The rules of court procedure ARE set by the legislature. With a few changes here and there, they are generally the same in EVERY court in the country – Complaint, Answer, Hearing. There can be a few other steps in between those, but it is not rocket science. But, oh no, when “poor little old me” has a legal matter at hand, the world needs to stop and figure out new rules JUST FOR YOU. The rules are the same for everyone, Pat, and everyone else BUT YOU manages to deal with them. In this instance, when you didn’t file an answer with the court, the Judge GAVE YOU EXTRA TIME. You were sitting right there in front of the judge. You have no excuse. But even though the judge bent the rules JUST FOR YOU, you didn’t file an answer with the court. And I have a pretty good idea why – it’s one thing for you to fling your turds at people on this blog, but it’s another thing to do it where your words have consequences, and you avoided that by pretending not to know what you were supposed to do, even when the judge told you right then and there. There is NO WAY that fence in the picture above is 13 years old. That section of fence is not even the same kind of fencing as the part visible behind you in the picture, which is clearly much more weathered. That fence – unfinished – stayed lumber yard new for more than a decade? Yeah, sure it did. And, yeah, funerals often bring together people who look around to see “what can we do to help out”. It’s not at all unusual for a helpful friend or relative to pitch in with some house repairs or yardwork since they happen to be visiting for a funeral and want to do something for the bereaved. Not unusual at all. There has been, throughout this thing, no reason at all for you to make such nasty remarks about everyone else involved. There are civilized ways of dealing with differences of opinion, and they don’t involve biting people or calling them names.